Recently I had to purchase a laptop for my friend, so I went on an ambitious adventure in the local laptop market. Nothing gives me more delight than walking through the aisles of laptop vendors in search of the one that I would just fall in love with. Fun as it was for me, it was also quite eventful. One hilarious experience that I recall and would like to share is an argument that occurred between me and a stubborn salesperson. In most cases the salesperson would normally yield to the customer if he or she seems to possess superior knowledge regarding the product. Although his marketing methods had little influence on me, I had lots of fun picking his brains. The argument basically occurred over the subject of whether the Intel Core i7-4500U is a better processor than the Intel Core i7-4700QM. His side of the argument was that they both are practically the same. However, this is clearly not true. 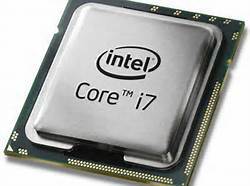 Following is my list of the best fourth generation Intel Core i7 processors for laptops. Coming in at number 5 is the Intel Core i7-4702MQ. With the base clock speed of 2.2 GHz and the ability to boost up its clock speed to 3.2 GHz automatically under heavier loads, this is one of the most powerful processors that you can find on laptops. Intel Core i7-4702MQ is a quad core processor that can run 8 threads at a time. The designation MQ has meaning. ‘M’ stands for mobile and ‘Q’ stands for quad. Priced at $378 it is not the best valued processor in the market though. At number 4 is the 4700MQ and yes this is the processor that was the subject of my little argument with the salesperson. With base speeds of 2.4 GHz and boost to 3.4 GHz, this processors is one of the of most common high-end Intel processors available in the market at the moment. Many brands tend to feature this processor model in their flagship multimedia laptops. This processor is also priced at $378 and therefore is a much better bargain the one mentioned previously. The laptops featuring this processor range from $800 to $2000. At number 3 is my personal favorite: the Intel Core i7-4800MQ. A quad core processor with a base speed of 2.7 GHz and a boost that takes it to 3.7 GHz. Priced at $378 like the previous two mentioned here, this is a processor that packs the best bang for the buck. Unfortunately, this processor cannot be found in laptops in the sub $1000 range. In fact the MSI GP60 2OD-072US was the cheapest one that I could find. Other laptops using this processor include the HP Envy 15 TouchSmart and the Lenovo IdeaPad Y510p. You have now reached number 2. So let me pull back the curtains and first introduce the runner up, the Intel Core i7-4900MQ processor. The excitement of presenting this processor; however, is short lived if you consider the value for the money. At $200 more than the previous 3 mentioned here, this processor features only an extra 0.1 GHz and an extra 2 MB of cache. This brings the clock speed of this processor to 2.8 Ghz -3.8 GHz with 8MB of cache. Perhaps not really a very a good bargain, if you ask me. It is now time for me to unveil my top contender. At number 1 is the Intel Core i7 4930MX quad core ‘extreme’ processor. Its hard to imagine a processor with better performance than this. If your budget is big enough to afford this $1,096 behemoth then by all means go for it. Yes, you do get all the bragging rights for free for having this device in your system. This processor is featured in some of the top gaming grade Lenovo Y510, Alienware and Toshiba Qosmio series laptops. As you can see, the Intel Core i7-4500U is not even on the list. You simply can’t compare a Toyota Corolla with a Bugatti Veyron, now can you? A lot more could be learned about Most Powerful Intel Processors Here! Article Source: EzineArticles by Author M. Qazi . Please keep in mind that all prices are subject to availability and should be used for reference only.